Gnaw, Gnaw, gobble, gobble, that’s what is going on in your attic and crawl space at the moment. The microbes, small animals and pests are busy nibbling away your precious belongings stuffed away in these dark places. They are attacking your valuables and you are unaware of this attacking spree. Your property will slowly get damaged and you may not be able to do anything about it. You need to get your valuable property inspected by a reliable attic and crawl space service and ask them to help keep it clean, hygienic and safe. You need to take the expert and top quality services of the Quartz Solutions and avail their first free inspection. Then prepare yourself for our long term, eco-friendly plans and innovative treatments for attic and crawl spaces. 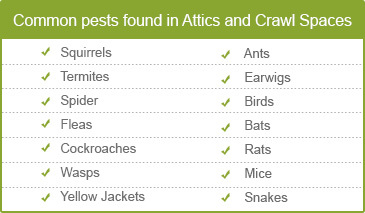 Pests, small animals and microbes can eat away into the basic foundation of your home. The wires, insulation, woodwork, walls, baggage, luggage, memories, and other valuables all stacked inside the attic, will diminish in no time. The damage at times maybe irreparable and salvage may take loads of money to restore. You need to get the attic and crawl space investigated right away! The gnawing away of pipes and wires can lead to dripping ducts. The insulation escapes and the electricity bill start to mount crazily and the microorganisms get around your home. A further health risk lurks because of the breeding roaches, wasps, pests and termites. Harmless looking animals like mice, rats, rodents, birds, squirrels etc may have made these dark areas their home and they can start to damage your property considerably. Humid areas encourage mold and mildew grow and this is detrimental for the basic foundation and woodwork of the house. Well maintained homes have sparkling attics and crawl spaces, and if you want to have your home labeled as the “most hygienic place” to live in, you need to get an inspection right away. Your crawl space may be spewing radon gas, one of the most carcinogenic gases ever heard of and you have to get rid of it. We, at Quartz Solutions, assess and meticulously inspect the attic and crawl spaces, free of cost, with the help of our proficient staff. 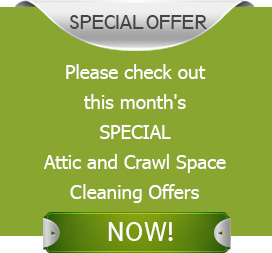 After a complete scrutiny, we will also guide you to the best future plans to keep the attics clean. Your hard earned money means a lot to us and that is why we provide cost effective and reasonable plans for your home. Huge green office parks and awesome shopping jaunts make living in Livingston, Essex County, NJ, a pleasure. The place is a haven for quaint houses, and Quartz Solutions promise to keep the attics and crawl spaces of the houses, in ideal condition. Nearly 29366 people live in this area and they need to live in homes that are perfect and free from toxic gases, animals, pests and microbes. We promise to give them first free inspection of attic and crawl spaces and also get the attic management solutions we offer. Hurry dial for Quartz Solutions at 973-536-1013 for Attic and Crawl Space Services in Livingston, Essex County, NJ (07039 zip code) now!